A-HOTEL.com - Saarijärvi B&B, lejligheder. Bed & Breakfast overnatning med morgenmad i Saarijärvi. Saarijärvi B&B, gjestehus tilbyr vanligvis mindre kapasitet med mindre ekstra fasiliteter enn hoteller. På den annen side leiligheter (pensjoner) i Saarijärvi tilbyr vanligvis mer koselig og familievennlig atmosfære og også gi morgen frokost. This newly built, spacious log villa features elegant interiors, a private sauna and a direct access to cross country skiing trails. The town of Jyväskylä is 1. Offering a salt therapy room and 2 beach volleyball courts, Metsolan pihapiiri is situated in Multia, 17 km from Keuruu. Guests can enjoy the barbecue and sauna. Situated next to the Kuusankoski Canal, Varjola Holiday Center is 7 km north of Laukaa. It provides rooms, suites and villas, a restaurant and a garden. Quietly situated in a peaceful setting in the village of Äijälä, this property is next to Lake Uurajärvi. It offers free Wi-Fi, along with free use of karaoke equipment and a row boat. Set on an organic farm, Guesthouse Kumpunen is 1 km from the UNESCO-listed Petäjävesi Church. 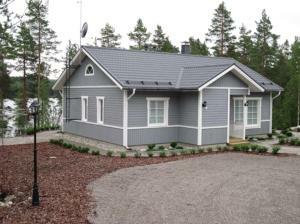 It offers summertime accommodation with swimming possible at Lake Kirrinjärvi, 60 metres away. 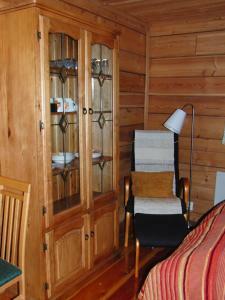 Bed & Breakfast Makasiini features accommodation with a garden and free WiFi, and is situated in Keuruu. A continental breakfast is available each morning at the bed and breakfast. Housed in an early 1900s countryside manor, next to European Route E75 and 15 minutes’ drive from Viitasaari, this hotel offers Finnish cuisine and a bookable sauna area with fireplace and terrace. Wiikki Manor’s modern rooms have parquet floors and oak doors. Featuring free WiFi throughout the property, Koirasalmen Luontotupa offers pet-friendly accommodation in Kivijärvi. Free private parking is available on site. Set in Ähtäri, Vanha pappila Hetki Oy features a garden and a terrace. Free WiFi is provided. Säynätsalo Town Hall Guestroom is situated in Säynätsalo. The building was designed by the Finnish architect Alvar Aalto. Featuring free WiFi, Pihlajaniemi is located on the beachfront in Rautalampi. This villa features a garden and barbecue facilities. Featuring a restaurant with local cuisine, award-winning Nukula Guestrooms is situated in Toivakka on Lake Päijänne. Free WiFi is available. Situated in Kinnula, Karkausmäen Kammari has barbecue facilities, garden and terrace. This 3-star inn offers a shared kitchen. Situated by Lake Kankarisvesi, this B&B offers free Wi-Fi, free parking and basic rooms with a private toilet room. Jämsänkoski city centre is 3. Overlooking Lake Mehtiö, this brightly decorated villa includes a private sauna, fully equipped kitchen and a spacious terrace and patio. Pieksämäki town centre is a 40-minute drive away. Located in Vilppula, Peltolan Luomutila offers accommodation with free WiFi and a sauna. Some units also have a kitchenette equipped with an oven. Hiekkaranta Bed & Breakfast features free bikes and a garden in Kuortane. Boasting a shared lounge, this property also provides guests with a terrace. Just 2 minutes’ walk from Jämsä Station, this refurbished 1950s inn offers en-suite accommodation, a café and a gift shop. Guests can enjoy free Wi-Fi and sauna access and free parking.